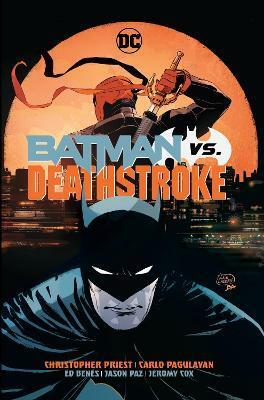 When Batman discovers a mysterious package containing DNA test results proving that he is not Damian Wayne's biological father, the Dark Knight sets his sights on his son's true father--Deathstroke! But Damian Wayne can't really be Slade Wilson's son--can he? And who sent the package--and why? The ultimate custody battle ensues as the World's Greatest Detective and the World's Deadliest Assassin clash in this instant classic! The Eisner Award-nominated series kicks into high gear in this standalone hardcover volume of Christopher Priest's critically acclaimed run. Collects Deathstroke #30-36. Christopher Priest is a critically acclaimed novelist and comic book writer. Priest created Static Shock for Milestone Media, Inc. The property became the first nationally syndicated African-American animated TV show, and Static continues to appear in DC Comics. Priest is also the writer of one of the most renowned runs on Marvel's Black Panther. He currently writes Deathstroke for DC Comics.